Austenitic gird welds are often characterized due to coarse grained weld material, strong root sagging and shrinkage groves in the root area. All these imperfections make the ultrasonic inspection more difficult. In the research labs around the world a lot of activities were carried out to overcome these problems. Special probes as well as special evaluation programs were developed. The quality of the austenitic base material and the welding procedure must be considered during inspection. 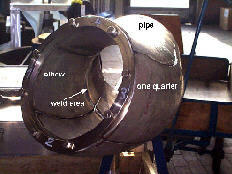 Other problems are sometimes the lack of accessibility, especially at the pipe weld inspection near elbows. However detection is the prime problem, but close behind, sizing problems are following. The present contribution describes the procedure we have carried out for the characterization of detected defects near the inner surface. Characterization means: is the defect connected with the surface or is there a ligament between the defect and the inner surface? When yes, is there any more information about the distance to the surface? To answer these questions some techniques can be discussed e. g. SAFT, TOFD or other image presenting techniques. During the experiments for the optimization of an ultrasonic technique, SAFT as well as the presentation in a B-scan image were used for the defect characterization. The detection of defects in welds and the adjacent areas are influenced e.g. by the weld root shape, root sagging, shape of the weld seam or other imperfections are the challenge for nondestructive inspectors around the world. Except the inspection of austenitic or other coarse grained materials, most of the nondestructive testing methods have a high and reliable potential for detection. In a lot of presentations and papers the difficulties about defect detection in austenitic welds are described as well as the solution of these problems [1-3]. For the ultrasonic inspection the signal to noise ratio is the important parameter for a reliable detection. Therefore investigations were carried out to improve the signal to noise ratio. This can be done by focused sound fields i.e. the interaction between the sound field and the grains of the material will be reduced. Unfortunately, focused transducers are unwieldy for practical applications. One of the reasons is the dimension of the probes and the other reason is the focused beam itself. Good solutions for the practice are Transmitter -Receiver - Probes (TR-Probes). Due to the crossing of the sound beam in a certain distance, the interaction between the grains of the material and the sound field is reduced to the sensitivity area. The drawback is that for a wall thickness up to 15 mm more than one probe is necessary. The detectability is one point, the other point is the sizing or the characterization of the failure. Characterization means, sizing and position of the defect in the wall. For the present paper we will find an answer of the question: is there a ligament with material between the defect and the surface or must be considered a surface-breaking defect? The investigations for the characterization of defects were carried out at a stainless steel pipe gird weld. The present paper is divided in two main parts. In the first part, theoretical results as well as experimental results, received at a 1 to 1 scale testblock with crack-like defects, are described. For the solution of the problem conventional ultrasonic techniques were used, which deliver special patterns from the different defect configurations. The evaluation of the pattern - measured and calculated by the theoretical model - was the main activity in the laboratory, with the aim to find some characteristics in the pattern, related to the defect configuration. Also the SAFT algorithm and the echo-tomography procedure were used for the data presentation and evaluation. The second part describes results measured on site at the gird weld in a nuclear power station in Germany. A theoretical model, developed some years ago [4,5], was used and modified for the given problem. The model regards the directivity pattern , the nearfield as described in , the point directivity pattern [8,9] and the ultrasonic pulse . The different main sound paths from the probe to the reflector and back, as well as mode converted sound paths are shown in fig. 1. The sound paths of secondary order are very important for the comparison of theoretical and experimental results, especially for reliable evaluation of the ultrasonic data by pattern recognition. With regard to the pulse shape the echodynamic behavior can be calculated for different ligaments and crack sizes by the superposition of the different sound paths. In the next figures some examples of the calculated pattern are shown and will be discussed. Previous experiments and calculations have shown that a frequency of 2 MHz and an angle of incidence in the range of 35° delivers acceptable and reliable results related to the aim characterization of near surface cracks. Therefore fig. 2 shows the results calculated for a 3 mm deep notch. The probe characteristic data are: angle of incidence 35°, frequency 2 MHz and the crystal size 9 x 8 mm2. The calculated results are presented in so-called TD-images (Time-Displacement) and are shown at the right hand side of the figure. The TD-image presentation of a surface-breaking notch is plotted at the right hand and at the top. Typical indications can be recognized: the well known corner reflection of the shear wave and with a different inclination the indication of the longitudinal wave. The indication coming from the longitudinal wave will not be noticed in the present paper. A weak crack tip indication very close to the corner indication is shown too. There must be a better separation between these two indications by deeper cracks, because the distance between the reflection at the crack surface and the crack tip is to short in relation to the ultrasonic pulse length. The result in fig. 3 shows this behavior as well. The upper tip indication is clearly separated from the corner indication. The basic for this result was a ligament of 2 mm and a 3 mm deep notch. Nearly the same results were received with a ligament of 4 mm, as presented in fig. 4. The two upper tip indications can be clearly distinguished from the corner indications. The weak lower tip indication is close to the corner indication and can only be distinguished due to the reason that the crack configuration is well known. A B-scan presentation of the previous example is demonstrated in fig. 5. Three indications in the B-scan above are clearly recognizable, one from the well-known corner effect, the other two from the upper tip of the crack. An other indication reflected at the lower crack tip but with weak amplitude is seen close to the corner indication. It is understandable that it is very difficult in the practice to distinguish this indication from the corner indication, because the theoretical results are free from grain and/or electronically noises. Crack tip indications can not be clearly distinguished from geometrical reflected indications. Therefore with 60° angle beam probes a separation between surface breaking cracks and cracks in the volume of the specimen is impossible. Using the geometrical reflection, the 60° shear wave probe has an advantage to deeper cracks or for cracks into the volume i.e. with a certain distance from the surface, because the echo-height is increasing due to the three angular reflection of the sound beam. The increase of the echo-height is usable with advantage for the evaluation of the measured data, since a small surface breaking crack in the range of 3 or 4 mm will deliver a weak reflected amplitude, whereas an increasing crack depth causes an increasing echo-height too. These circumstances together with other ut-techniques will help to evaluate the measured data and will be described in the next chapter. Also the theoretical investigations were carried out to reduce the experimental expenditure. Experiments were done with a 1 to 1 scale austenitic pipe test-specimen with EDM notches. The test-specimen is shown in fig. 6. For the optimization of the ut-techniques this testblock was cut into 4 pieces. Fig.7 shows one of such a piece. The EDM notch with a ligament, in that case 4 mm, is visible in the magnification. In the total 8 EDM notches were eroded in the weld area. The dimensions are listed in the table below. Some results out of a lot of experiments will be presented. Fig.8 shows the result of a 3 mm deep notch connected with the surface. The B-scans were made by superposition of the A-scans into the beam spread of the used probe. This procedure is known as echotomography or video SAFT. The B-scan at the left-hand side was measured using a 35° angle shear wave probe with a frequency of 2 MHz. One clear indication is visible. This indication is generated due to the corner reflection. At the right hand side the results measured with the 60° shear wave probe are shown. There are some indications at the inner surface, at the estimated position of the crack and at the center line of the weld. This example has 20 dB more amplification related to the previous result, also seen at the noise structure of the B-scan. However, as well known the reflectivity of 60° shear waves at a corner reflector is still weak. A different situation will be at deeper cracks or cracks into the volume with a ligament in the range of 4 mm. The result is presented in fig. 9. In both B-scans two indications are clearly visible, one at the inner surface and the other into the volume. The result from the 35° shear wave probe shows the corner indication and a crack tip indication. The evaluation of the crack tip delivers a distance to the inner surface of approximately 4 mm, consequently identical with the lower crack tip. 35° shear wave probe: Is the measured echo-height above or equal the registration level, we must assume with a high probability a surface breaking crack or a crack with a ligament in the range of 2 mm. 60° shear wave probe: Is there also measured a clearly indication, a high probability for a deeper crack must be assumed. Over all probes: Is there a clearly indication measured with the 60° shear wave probe and a weak indication with the 35° probe, we can assume a crack in the volume and a ligament between the lower crack tip and the surface. The reliability for this statement is increasing, if the 60° longitudinal wave probe gives also a clearly echo, generated by mode conversion. It is still known, that this strategy as well as the principle procedure for the inspection was made for ideal conditions as they are usual in laboratories. However on site the conditions are changed and not comparable with those of the laboratory, but with this principle procedure an evaluation strategy can be carried out. Some results received during the outage of a PWR and the examination of a surge line weld will be presented in the next chapter. The optimized techniques were used for the inspection of the austenitic gird weld at the surge line. With the 35° probe some indications with weak amplitude were detected at the inner surface of the pipe. Fig.10 shows an example, out of the whole results, of a B-scan at a circumferencial position of 80 mm, starting from 12 o'clock in the clockwise direction. 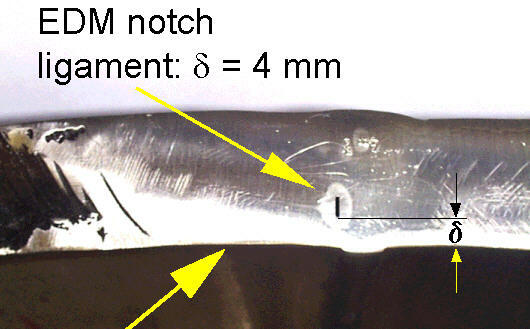 The evaluation of this indication, supported by visual ID inspection some years ago shows, that the indication was generated by a penetration burning notch at the weld root. Also the measured amplitude is approximately 10 dB beneath the registration level. From that result it is unlikely that a deeper crack exists at the inner surface of the pipe. The probability for this statement is in- or decreasing if the results of the 60° shear- or longitudinal waves were evaluated respectively. The results will be shown later on. On the other hand a second indication at a distance of 6 to 7 mm, starting from the ID is recognizable too. This indication is maybe generated due to diffraction at the tip of the detected defect or due to reflection on the inclined surface of the defect. Anyway, this singular result of the 35° shear wave probe gives a hint about the complex defect situation. 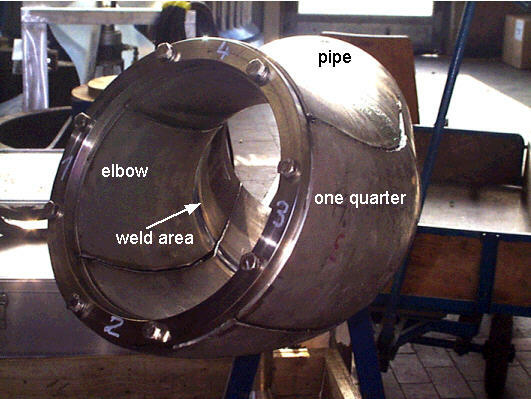 Considering the geometrical behavior at the 12 o'clock position, the inclination of 16° between the coupling surface on the elbow and the welded area must be regarded for the evaluation. Further, using the 60° shear wave probe, examples are presented in the next figure (fig. 11). Due to the geometrical shape of the weld cover the scanning movement in the direction to the elbow was restricted and therefore the dynamic of the defect is not complete. For data presentation two kinds of evaluation procedures were carried out, the echotomography (fig. 11a) and the SAFT reconstruction procedure (fig. 11b). In both cases the defect position can be estimated but unfortunately a defect sizing by evaluation of tip indications was impossible. These indications were not detected in the whole examination area. The evaluation of the reflected amplitude - the classical sizing procedure using ut-techniques - is the only information about the defect size. A 4 mm flat bottom hole delivers an equivalent echo-height. Nevertheless, the evaluation gives the information about an embedded defect i.e. a defect without ID connection. Comparing the results of 35° and 60° shear wave, the evaluation strategy delivers the same result. For remembrance, the amplitude of the 35° shear wave probe was weak and that of the 60° was strong, in some cases just about 12 dB above the registration level of a 2 mm flat bottom hole. Transmitter-receiver angle beam probes for longitudinal waves have some draw-backs because both bulk waves are always present in the material. But this could be also an advantage if mode conversion can be used for the detection of defects. A 60° 2 MHz TR-probe was used in parallel to the shear wave probes using the mode conversion at the defect - transverse wave to longitudinal wave. Fig. 12 shows the result at the same circumference position presented at the previous illustrations. The schematic drawing gives an idea about the sound paths between the probe and the defect. The basis for the preparation of the B-scan was the longitudinal wave, because a mixture between the two bulk waves for the reconstruction has not been developed for the time being. For the estimation of the position of the defect into the material, an iterative method comparing the measured time of flight and the calculated was used. The input parameters are the measured time of flight, the probe position, the wall thickness and the inclination between the coupling surface and the weld. Carrying out this calculation for the given example, a distance of 7 mm between the center of the defect and the ID was calculated as well as an axial position of 4 mm distance to the weld center line. These results agree very well with those measured with the 60° shear wave probe. The optimization of ultrasonic techniques using theoretical models has shown that the experimental investigations can be reduced and therefore the expenditure. In parallel to the theoretical work, supporting experiments were carried out. This gives the guarantee that no limitations in the interpretation and evaluation must be regarded by the application of the optimized techniques on site. In the present contribution the comparison of results measured in the laboratory and those received on site were done by the application of the evaluation strategy which was prepared based on the experiments in the laboratory. The presented examples have shown that with conventional ultrasonic probes a decision between surface breaking cracks and embedded cracks is possible if multiple ultrasonic techniques e.g. 35° and 60° shear waves together with 60° longitudinal waves are used. The theoretical parts of the present paper are developed under the order of the Federal Ministry for the Environment, Nature Conservation and Nuclear Safety. The content of this contribution is presenting the meaning of the authors and must be not in accordance with the meaning of the Federal Ministry for the Environment, Nature Conservation and Nuclear Safety. The authors of BAM would also like to acknowledge Nuclear Power Plant Stade for its financial support of the experimental parts of the present paper.